Chatham Lodging Trust (CLDT) is a hotel REIT that went public in 2009. The company focuses on upscale, extended-stay hotels and premium-branded, select-service hotels. The company works with well-known and trusted brands such as Marriott, Hampton Inn, Hyatt, and Hilton. The company owns interests in 135 hotels totaling over 18,000 rooms and suites. Chatham Lodging wholly owns 40 of these properties with an aggregate of approximately 6,000 rooms and suites and has minority investments in two joint ventures that own 95 hotels with an aggregate of around 12,500 rooms and suites. Most of its properties are located in major cities on both coasts, as well as fast-growing states such as Texas, Florida, and South Carolina. The company's principal customer base includes business travelers. 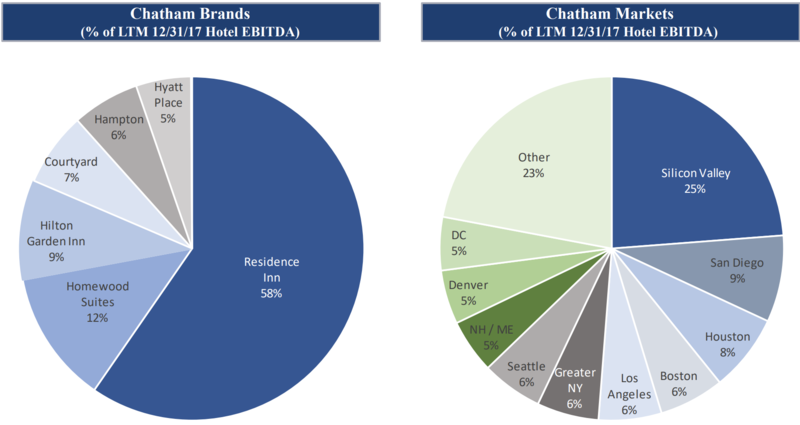 Chatham's business model is somewhat unique in that it's one of just three publicly-traded REITs that is almost exclusively focused on select-service hotels. Selective service means that these hotels usually only offer self-services such as business centers, small gyms, laundry facilities, swimming pools, and complimentary breakfast bars. Despite lacking amenities like full-service restaurants, concierge services, and room service, select-service hotels are usually able to charge similar, if not slightly higher, room rates than full-service hotels. This lower-cost business model means that even though Chatham is a very small REIT (market cap under $1 billion), it's able to achieve the highest EBITDA margins of any of its peers. Part of the REIT's impressive profitability is due to its disciplined management team led by CEO and Chairman Jeffrey Fischer. Mr. Fischer has more than 30 years of industry experience and has shown a strong dedication to a "quality over quantity" investment approach. Capital recycling (selling assets at a profit) is an important component of any REIT, and is a way to also maintain a strong balance sheet. In 2017, for example, the company sold the 145-suite Homewood Suites by Hilton Carlsbad, California, for $33 million at a cash yield (cap rate) of 6.5%. That same year the REIT spent $132 million on three new hotels with cash yields of about 8%. Compared to its cash cost of capital of about 5.2%, Chatham achieved a nice yield spread of approximately 2.8%. In other words, management is very good at balancing various sources of funding, including retained cash flow, low-cost debt, proceeds from assets sale, and new equity sales, to fund investments that grow Chatham's adjusted funds from operation (AFFO) per share. However, due to its small size and the unpredictable timing of these deals, including selling $151 million in new shares (that increased the share count by 18%), AFFO per share declined 7% in 2017 and is expected to fall another 13% in 2018. The good news is that management's guidance still means that the current $1.32 per share annual dividend (paid monthly) will have a relatively safe AFFO payout ratio near 70% in 2018. In addition, this guidance seems conservative since it assumes no new acquisitions and very limited organic investment spending. Management has several past investments coming online in 2019, so even assuming no acquisitions the company should see stabilization in AFFO per share growth next year. Chatham essentially offers one of the industry's top yields, but one that is still reasonably covered by AFFO. Note that due to the variable nature of hotel revenues (very dependent on the economy's health), all hotel REITs generally have much lower AFFO payout ratios, usually in the range of 50% to 70%. That's compared to 75% to 85% for most other REIT industries. The lower payout ratio is necessary to ensure more stable dividends over time, as well as lower costs of capital. By retaining around 30% of its AFFO, Chatham is able to depend less on debt and fickle equity markets for investing in its business. Another important aspect to REIT investing is a sound balance sheet. After all, the REIT sector is highly capital intensive and required by law to pay out the majority of taxable income as dividends. Not surprisingly, most REIT carry a lot of debt. If their cash flows can't service their obligations well, or they breach debt covenants, then a REIT's access to low-cost borrowing can be cut off. That in turn can cause a liquidity and growth trap, as well as force management to cut the dividend even if it's well covered by AFFO. Chatham has done a nice maintaining conservative credit metrics, which has helped the company obtain relatively cheap loans with an average interest rate below 5%. No major debt payments are due until March 2023 either, so the company appears to have a solid balance sheet to help protect its monthly payout (Chatham does not have a credit rating given the company's small size). Overall, Chatham Lodging Trust appears to be a well-run hotel REIT. Management has done a nice job focusing the business on owning premium and highly profitable properties located in strong urban markets with fast-growing economies. As the REIT continues to moderately grow over time, greater economies of scale should only help its margins improve, resulting in potentially stronger long-term dividend growth. With that said, there are several industry and sector-specific risks that investors need to understand before considering adding this REIT to their diversified income portfolios. 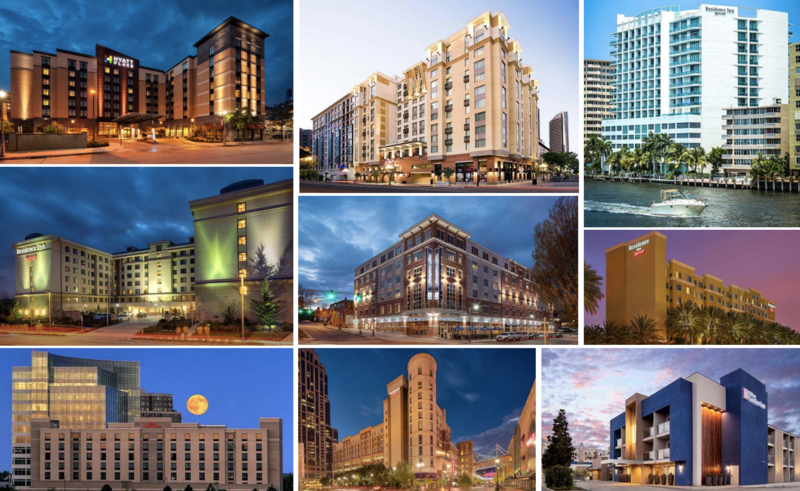 Income investors need to understand that hotel REITs are very different than many other industries in the sector. Most notably, they lack the long-term cash flow predictability that many other REITs enjoy. For example, triple net lease REITs usually sign 15 to 20-year leases that create solid cash flow visibility in all types of economic environments (as long as tenants remain healthy enough to pay their full rent). However, hotels operate on a short-term basis in an industry that's highly sensitive to the overall consumer and business economy. In addition, the industry has been benefitting from a lack of supply growth created by the financial crisis, which forced developers to greatly slow the amount of new construction as demand plunged. As the economy recovered, rising demand created a relatively large demand versus supply imbalance, especially in key growth markets such as many of the large and fast-growing cities Chatham targets. This resulted in average daily room rates (ADR) rising at an accelerating rate and occupancy reaching a new record, attracting developer interest and spurring additional hotel construction. However, new supply is finally being completed and has caused the demand-supply imbalance to shrink. Further adding to supply are disruptors like AirBnB. While the "experiential" focus of AirBnB means that it's not necessarily competing for the same customer base as Chatham, analyst firm Hoya Capital Real Estate estimates that AirBnB has been adding 1% to 2% a year in supply in key markets such as New York City, Miami, Los Angelos, and San Francisco. 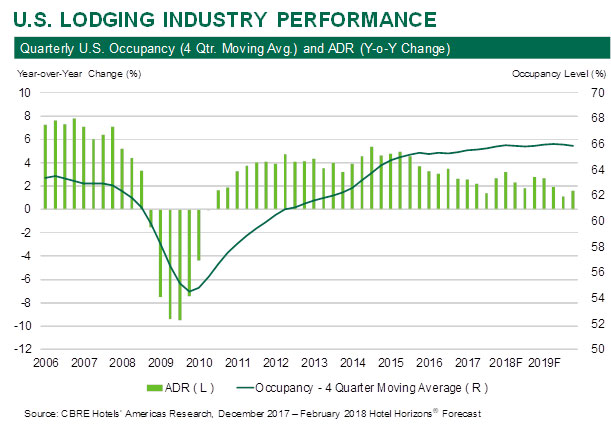 As a result of these factors, hotel REITs can't necessarily count on short to medium-term room price increases to fuel strong organic growth in AFFO per share. Expanding property portfolios in a profitable manner could also prove to be difficult in this environment, especially in a rising interest rate environment. Remember that the REIT sector is highly capital intensive, and REITs are required by law to pay out 90% of taxable income as dividends. This means that they are highly reliant on external debt and equity capital financing to finance their growth. Thus far rising interest rates haven't harmed Chatham's ability to obtain low-cost debt on attractive terms. In fact, in March 2018 the REIT was able to extend its $250 million revolving credit facility from 2020 to 2023, while simultaneously lowering its interest costs. As a result, Chatham can now borrow at just 4.1%, which is about half the cash yield on new investments it's been pursuing. However, keep in mind that this debt is variable rate, so financing costs will rise if interest rates increase. In that scenario, the REIT might have to focus more on equity issuances, which can be a problem if the share price is too weak. The REIT sector has been in a bear market over rising interest rate concerns, and Chatham's shares are trading near a multiyear low. If the firm's cost of capital rises too quickly, profitability on new investments could fall. When combined with a weaker outlook for hotel room rates, Chatham's AFFO per share growth seems likely to slow significantly. Therefore, investors owning hotel REITs like Chatham need to expect little to no dividend growth. That's especially true if we get another recession before the industry's oversupply issues can be addressed. In addition, keep in mind that hotel REITs in general have a much higher propensity for cutting their dividends than most other REIT industries. Chatham did not exist prior to the financial crisis, so it does not have a very long or battle-tested dividend track record. Given the cyclical nature of its cash flow, a future dividend cut during a recession could be very possible. Hotel REITs, by their very nature, are medium to high risk dividend stocks to own over a full economic cycle. While they generally sport some of the lowest AFFO payout ratios of any REIT industry, they also lack the kind of long-term recurring cash flows that allow most REITs to preserve and grow dividends during economic downturns. 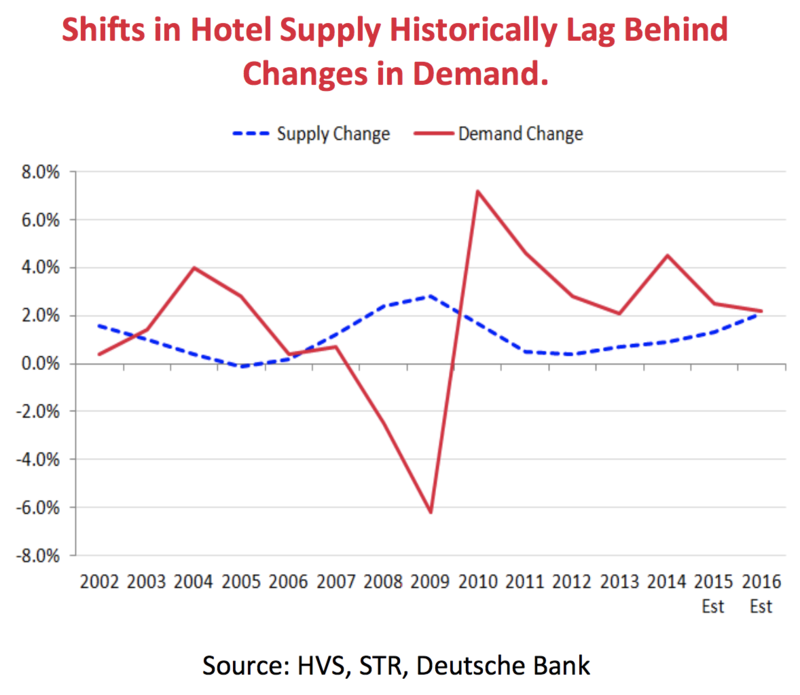 In addition, the cyclical nature of the hotel business, with naturally lower and more volatile occupancy, means that this is not a defensive (recession-proof) industry. That being said, Chatham Lodging Trust has demonstrated an impressive ability to grow quickly, but in a disciplined nature, over its relatively short life as a public company. The company's management team takes a disciplined approach to capital allocation, including a relatively conservative balance sheet and payout ratio that could help preserve the payout during the next downturn. However, low-risk investors, such as retirees looking to live off dividends that are unlikely to ever be cut, might want to avoid even this top name in a relatively higher-risk industry.